This is the second book by Mr. Lunde on wind toys that I have. He expands on all the subjects from his first book. He expands on some areas and materials used for the construction of the Key elements in the design and construction of Whirligigs of all types and sub types. 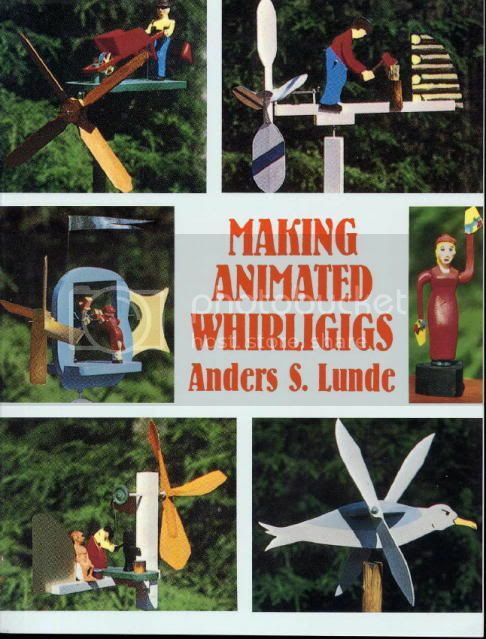 Starting with a chapter on the wonderful world of Whirligigs, including a discussion about doing your own thing with them and not copying them, more ideas, women in making whirligigs, tools and materials and the lay out of the text and the rest of the book. Chapter’s 2 through 4 are expanded coverage of the general design of larger whirligigs. Chapter 2 : An over view of all the major styles and types of them. Key elements in their design, base, pivot point, mountings, propellers, driving mechanisms, tails or rudders and the use of moving objects or figures on them. Making a plan, and the thinking out of the use of materials in design, the hardware, and little bits that will make the construction easier. Figures in the design, whether they are human or other. The design of large birds which has considerations that the smaller gigs does not. Starting with the weight of the total materials to whether it will be a hollow form or solid or built up bodies. Along with the scaling up of the other elements that will drive it. Chapter 3: Whirligig mechanisms, from supporting devices(brackets), drive shafts(bolts), and camshafts and all the intended items that go with them. Chapter 4: Propellers, principles and design. From simple propellers and the assorted styles. Four bladed propellers and their hubs. Multibladed propellers, metal propellers, all metal or just the metal bladed. And unusual designs. Chapters 5 to 12 are construction of the various styles of whirligigs. Each of the subject whirligigs, has a material list and any specific information to that type. The book is filled with clear precise line/drafting type drawing both as to the mechanisms, and bodies of the style. Again all styles of whirligigs are covered, from direct drive types to the Mole Chasers under the functional types. And finishes up with Multiple Activity types. There are a number of graph paper style plans for 12 different ones to get you started. The final chapter 13 is covering Craft Associations, Exhibiting, Marketing, Merchant class, A short summary of Marketing Principals (this is not a marketing book) and some final words.